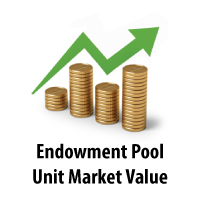 The Endowment Pool unit market value and the market value date for a series of quarters are listed below. Also listed are the last several twelve-quarter averages of the unit market value. The change in unit market value, which is communicated quarterly through FBS News, is necessary in projecting endowment income using Method 2. Instructions for Projecting Endowment Income explains the projection methods.